As a ski club we've been around Rochester, NY for more than 40 years but members also very actively enjoy a wide range of year-round group activities in the Rochester and upstate New York area. Come join us for downhill and cross country skiing, bicycling, kayaking and canoeing, snowshoeing, camping, picnics, casual and formal dinners, happy-hours, and much more. Throughout the year we also have many group trips around New York State, around the country and around the world. We're a mix of men and women, both singles and couples, skiers and non-skiers alike. Some of our most active members don't ski at all. You might think of us as the Huggers Ski, Outdoor Recreation, and Social Club. We offer fun times for everyone 21 years or older. 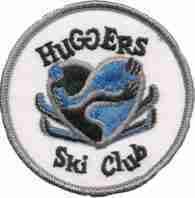 What is the origin of the name "Huggers Ski Club"? It may have been while on a ski trip at Mt. Tremblant when both experienced and inexperienced skiers were falling down that the term "hugging the slope" (due to the skiing conditions) came to mind. The following is from a very early Huggers Ski Club newsletter. ALTHOUGH THE HUGGERS' SKI CLUB does not date back any farther than the year 1969, the HUGGERS, in its second year as a SKI CLUB in Rochester, looks forward to a most memorable future. WE began as a small group consisting of General Dynamic's employees. the name of THE HUGGERS' SKI CLUB. S K I I N G !!!!!!! THE CLUB itself consists of four officers, a Board of Directors and a Social, Trip and Communications Committee -- all comprising the body of THE HUGGERS’ SKI CLUB. TO take a look at the past, we decided that since we were a young and new CLUB, we would remain an active CLUB during the past summer. A trip to the Jersey shore, a combined dance and picnic, a road rally and clambake were held for the purpose of keeping old members together and to gather up new ones. As a result, at the end of September of this year, we have more than doubled our membership list. We are all of various ages, both married and single, are engaged in various careers, are a combination of novice, intermediate and expert skiers, but all of us enjoy a good HUGGER time. FOR the SKI season l971 – 1972, the HUGGERS have made tentative plans for trips to Stratton in January, the Mad River, Glen Ellen and Sugarbush area in February, and a return trip to Mt. Tremblant in March. To get ready for the SKI year, the- upcoming months are being spent in preparation so that when the snow falls, THE HUGGERS will he ready!!!!! STARTING in late October and November, the HUGGERS is holding a dry land SKI school. For those of you who do not know what a SKI, SKI boot, or snow looks like --- this is for you. For those of you who know the above, you have advanced [sic] to the Brantling Ski School. Brantling ski area has offered ski instructions to the members of the HUGGERS’ SKi CLUB for a nominal fee. Brantling’s ski school includes six (6) lessons, one hour each and up to three (3) hours of free skiing after each lesson. Instructions will cover groups ranging from novice to race skiing. TO introduce the formal SKI season, the HUGGERS will have a combined hay ride and wine party in November. THERE we are, PAST, PRESENT and FUTURE!! ON the second Thursday of every month, all of the HUGGERS meet at Rutmer’s Tavern (Avenue D and Remington). We would like to meet you at our next get to­gether. If you forget where we are, ask anyone around -- we're sure that they've already heard about THE HUGGERS SKi CLUB!!!!!!!!! !